I came across an ad today for a typeface that mentioned ‘Didone’. Didone is a typeface category recognized by the Association Typographique Internationale (AtypI), and part of the VOX-ATypI classification system. It emerged in the late 18th century. The category is also known as modern or modern face, in contrast to old style serif, which dates to the late medieval era. Straight (hairline) serifs without brackets. 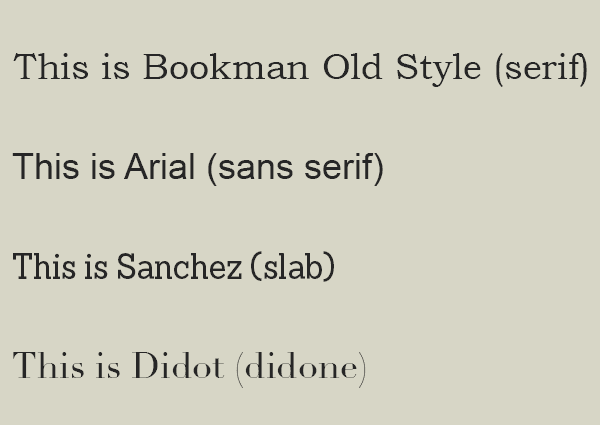 Didot is a name given to a group of typefaces named after the famous French printing and type producing family. The classification is known as modern, or Didone. Take a look at the Wiki entry – it talks about the CBS logo that used the font for years. As a professional calligrapher I have always been interested in typefaces and how they relate to the hand-held pen….this one would be uncomfortable to accomplish with a straight-cut, chisel-edged nib until one got used to an odd angle of the wrist…..the “airiness” is clean looking, but makes reading harder on the eyes…. How interesting that you are a professional calligrapher. How did you get into ‘callig-ing’? Can’t say I like it. I do like Sanchez, though. Many years ago, I took a course in calligraphy. Didn’t do well, didn’t have the stamina, I guess. The guy said it looked as if I was holding a surgical instrument [I’m left-handed]. It’s definitely difficult for a left-handed person to learn calligraphy from a right-handed teacher….but I’ve known some fine southpaw calligraphers. They had to figure out their own ways of holding the pen and achieving those thick and thin lines in the right places!